Volunteer Recruitment Month at the MNCH! Learn. Inspire. Connect. Volunteering at the museum is a great way for lifelong learners to make new friends and share their passion for science and history. 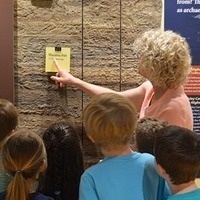 From leading exhibit tours to helping with children's events, the museum offers a variety of fun ways to get involved. Volunteer applications will be accepted through September 24. Visit our website to apply or learn more. The volunteer training program will be held Tuesdays and Thursdays, October 2 through 25, from 2:00 to 4:30 p.m. Questions? Contact our volunteer coordinator at mnchvolunteers@uoregon.edu or 541-346-1717.